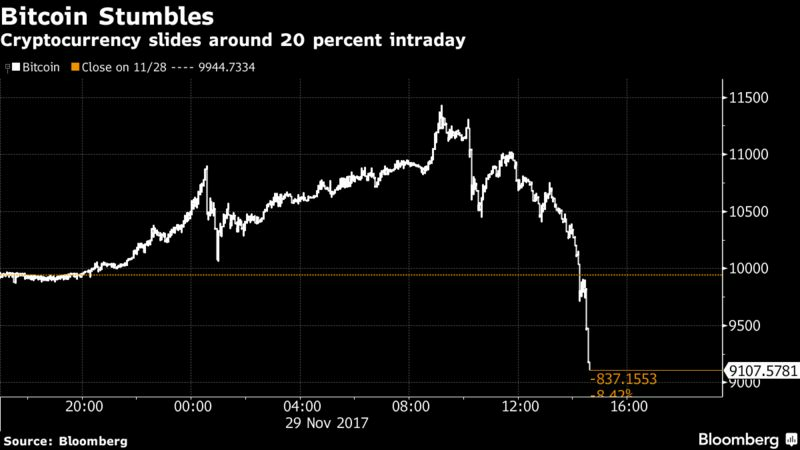 Bitcoin plunged as much as 20 percent hours after a rally past $11,000 generated a surge in traffic at online exchanges that led to intermittent outages. The plunge capped a wild day for the largest cryptocurrency that included a breakneck advance to a high of $11,434 before the reversal took it as low as $9,009. As of 3:36 p.m. in New York, it traded at $9,911.10, virtually unchanged from where it began the session. The heaviest selling came amid reports of service outages and delays on some of the largest online exchanges. The extent of the problems on platforms such as Coinbase and Gemini remained unclear, with several saying massive spikes in traffic had caused unspecified problems. Coinbase remained unavailable to some users. Bitcoin had rallied 20 percent in just four days, topping $10,000 for the first time earlier this week in a runup that drew increased warnings it was in a bubble. The cryptocurrency ended September at $4,171.25. While not uncommon, outages at online exchanges have earlier led to selloffs in cryptocurrencies. Coinbase, one of the biggest platforms, earlier tweeted traffic was at an all-time high after bitcoin surged to a record $11,434 at 9:11 a.m. in Bloomberg composite pricing. The cryptocurrency is extremely volatile and susceptible to major dips — it’s fallen by at least 25 percent on three separate occasions in 2017 already.